[Britain’s Edwardian] serenity was misplaced. Astute observers at home warned that Britain was losing its industrial supremacy and was indifferent to its ill educated population. Acute observers abroad declared that the solidarity of British life was an illusion. The American historian Brooks Adams (brother of Henry) forecast the departure of Britain from the historical stage. The steel production of the United States and Germany was overtaking that of Britain; and the Boer war had revealed Britain’s inefficiency as a world power. Conrad heard the tumult beneath the surface of that thin crust men called civilization – the anarchist world of the secret agent or of Henry James’s Hyacinth Robinson. But there was one writer in particular who was aware how thin the crust was and who redefined the gentlemanly ethos, and it was often through his eyes that Our Age was told to admire it. That was Kipling. 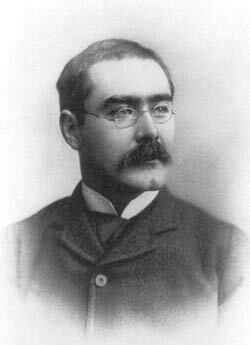 Kipling wanted his generation to recall how much the gentleman owed to society. He valued the independence of the individual – as an artist how could he not? But the individual left on his own, isolated and lonely, disintegrated. Particularly in India where men and their wives died young, where to take one’s work seriously could result in madness because government, unlike in England, never achieved results. What prevented such a society from going over the precipice? Kipling answered: religion, law, custom convention, morality – the forces of social control – which imposed upon individuals certain rules which they broke at their peril. Conventions enabled men to retain their self-respect and even to live together under appalling circumstances. Those who break the conventions must be punished. Numbers of Kipling stories contain scenes in which the individualistic, the eccentric, the man who offends against the trivial rules of the club, are tarred and feathered with gleeful brutality. If the offender is not brought to heel, society will suffer. It is not worth spending much effort, Kipling thought, debating whether the customs, morality and religion of the place you live in are right or wrong. His contemporary, the anthropologist James Frazer, was informing the learned public that religion and magic were a kind of primitive science which would vanish as scientific knowledge spread; but for Kipling, as for Max Weber, religion was a social fact. These forces of social control, as Kipling admitted, were harsh. The harshness could be alleviated by belonging to in-groups. These in-groups protect the individual, give him privacy, identity and self-confidence. They are the family, the school and the craft or profession you follow. These in-groups, too, teach us our place. We all need a course of indoctrination to find our place and, if you have come up in the world, to be taught it. But when the individual has proven himself in his in-group, and so long as he is not in the strict sense of the word of an eccentric, then the more daring his behaviour and the more abundant his action, the greater is the addition of joy in the world. Stalky was the prototype of this socialized individualism. He acted beyond the formal law of school or army regulations and possessed the gift of seeing himself from the outside in relation to society. In Kipling’s world action revitalized man. That was the obverse of suffering it caused. And suffering was inevitable. Political action is often not a choice between good and evil but between lesser and greater evil. Social realities interested Kipling. The liberal pictures man as choosing goals to pursue and asks whether or not he is free to pursue them. Kipling thought that men and women were forced to accept those goals which their group or clan in society chose for them and only when they had accepted these constraints were they free to exercise their individuality and take it for a trot. He is not unlike Durkheim who saw the individual as a bolt which might snap if the nut of society held it too tightly, or by being too loose allowed it to vibrate. Excessive integration as in the officer caste in the Army could be as dangerous as imperfect integration. Brought up in a society untouched for generations by civil wars, revolution or economic disaster, Kipling’s English contemporaries were never compelled to consider why society still continues to hang together. But in India Kipling was forced to consider it. He believed that man achieves happiness when he comprehends where he himself fits into the scheme of things. He has to realize that spring cannot forever be spring and that winter succeeds autumn. Since men continue to nurse illusions they must be taught the terms on which they are allowed to rise. Subject the upstart, therefore, to a course of indoctrination to bring his ambition within bounds and turn his children into gentlemen. Whereas for most of the greatest writers society, with its rules, conventions, customs, morality and taboos surrounding the sacred, is the enemy and their characters in fiction are depicted as locked in heroic combat with them, for Kipling they are a donnée with which mankind has to come to terms or perish. Kipling therefore defined the gentleman differently from Trollope. His gentleman has come down in the world, is harsher, more meagre, with fewer graces and more limitations. The gentleman has now become the manager, the colonial administrator, the engineer and the skilled worker. You feel his gentleman is more beleaguered. He is threatened from above by the politicians, threatened from below by the lower orders who now have the vote, and threatened by the new barbarians in Europe. In the fable of England he wrote for his children Kipling scanned the future with anxious eyes. Would the wall of British civilization fall again before the democratic hordes of little men and the barbarians, the Prussian Winged Hats? Were not the younger rulers like Churchill tainted by the same ambition that made Roman generals overpower the emperor? Were not the financiers manipulating trade and industry to their own ends, were not luxury and wealth corrupting the ruling class and turning their children to flannelled fools at the wicket? What would be England’s fate?